VAFA 2018 - the sixth Video Art For All International Video Art Festival will be held at Casa Garden this coming November. Organized by Orient Foundation and Art For All Society, this event is sponsored by ICM and was launched in 2010. The festival has continuously received an overwhelming response to its International Open Call with submissions from the 4 corners of the world always exceeding in numbers of applicants. VAFA have also grown in format during the years partnering with worldwide renowned video art festivals such as VideoBrasil (Brasil), FUSO (Portugal), and Videotage (HK) to bring guest curators and special event screenings. In 2012 the festival started to be a biennial and with that started to invite top artists in the field to present their work in Macau including them in outstanding screenings - names such as AES+F, John Baldessari, Laurence Weiner, Harun Farocki, William Wegman, Miranda July, Zhang Huan, Cui Xiuwen and Xing Danwen are among this international voices that have been largely contributing to the affirmation of video art in Macau. The open call for this year festival’s is now open accepting submissions till 30 of August. A number of words will be selected for the main exhibition and some other works will be included in screening sessions. 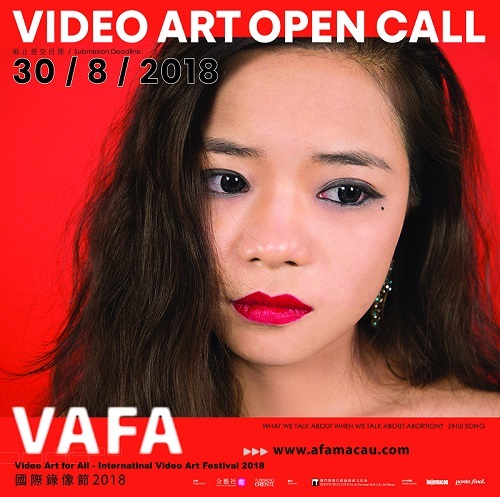 The First Prize winner receives US$1000 and is invited to come to Macau to receive the award and share his work in a talk with his flight fee and accommodation also covered by VAFA. This year VAFA will also recognize two other works with merits and a US$500 prize. Don’t miss this opportunity to see your work featured in an international festival. For more details or information please contact with us at +853 2836 6064 or email to vafa2016@afamacau.com.